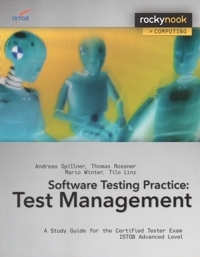 Aimed at software developers, project managers, quality managers, team leaders, or anyone wanting to become a true testing professional, Software Testing Practice: Test Management adresses the major issues related to advanced, state-of-the-art test management. This book covers the syllabus require to pass the Certified tester Examination – Advanced Level as defined by the International Software Testing Qualifications Board (ISTQB). Included are best practices in the field of testing, as well as detailed descriptions of involved tasks, roles, and responsibilities. Well suited for self-study, the reader is “taken by the hand” and guided through the key concepts and terminology of software testing in a variety of scenarios and case studies (as featured in the first book in this series, “Software Testing Foundations”). Not only will testers and test managers find this a must-read, but anyone requiring advances professional knowledge and skills in this field will find this book a must for a successful, well-founded education in advances test management.